- Rest timers between sets. Please post any comments or suggestions here. You may also choose to create a routine featuring your favorite exercises. Multiple routines can be created for multiple days or multiple users. - Time: Enter time (hours, minutes and seconds). Note, you can either enter a time and move on, or user the built in timer to countdown the specified time. You can keep entering new information for each set. 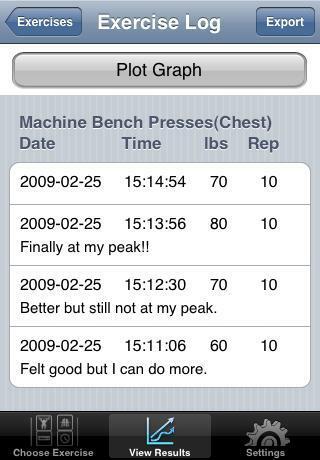 You can also choose to use a countdown timer to measure your rest periods between sets. When you have finished the exercise, tap “Exercise complete” to register your results. You can also attach a note to each set by tapping on the Note icon on the top right of each screen. 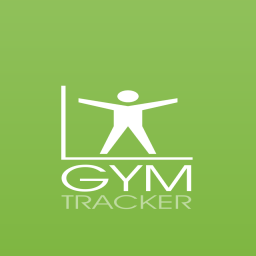 View a summary of data for each exercise that you have performed. You can also view any notes that were attached to individual sets. This data can be then be emailed to you using the Export feature. View a graph of recent results for a particular exercise. - Turn on a rest timer between all sets.